Staff at UCLA OB/GYN at West Medical provide critical care and support for a diverse patient population. 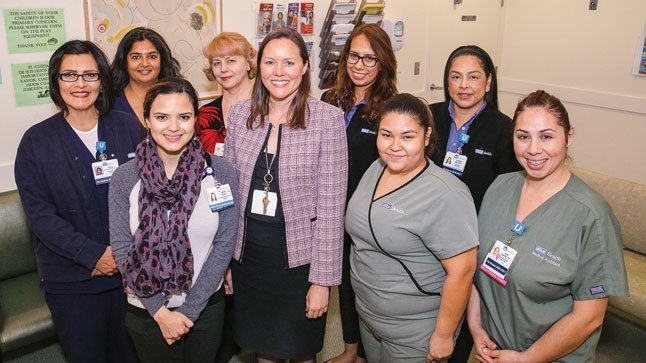 The staff at UCLA OB/GYN at West Medical strives every day to provide excellent care for its patients. A recent $50,000 grant from The Nicholas Endowment will enable them to do even more. Many of the women who receive services at this location have complex medical issues. According to Vanita Varma, nurse manager at UCLA OB/GYN at West Medical, patients come to UCLA because they know they’ll receive the latest and best care there. But this low-income population has other needs that are obstacles to their health. “Some of our patients live far from the clinic and are not able to afford the gas and parking costs associated with a trip to the clinic,” Varma says. With patients frequently missing appointments or arriving late, the clinic struggled to maintain an efficient schedule that would provide timely care for everyone. Worse, women who are not getting the prenatal care they need face greater risks of pregnancy- and delivery-related complications, which also places their babies at higher risk of experiencing health issues. In 2016, Katie Siedel, clinic manager at UCLA OB/GYN at West Medical, wrote a successful grant proposal for a patient-assistance fund. The award will help patients pay for gas, parking, Uber or bus rides, and food. It also includes hotel vouchers for patients whose visits require an overnight stay.